I’m trying to forward you a cool email that I got from the Working Families party about a video contest to tell stories of “renters’ hell,” but it keeps being labeled “spam.” Any workaround? Weâ€™re holding our first ever video contest, where you have a chance to win a monthâ€™s free rent just by telling your rental hell story on camera. Youâ€™ll also be raising awareness about an important issue that affects millions of New Yorkers: the need for stronger rent laws. We know it was awful, and weâ€™re sorry. But guess what? There could be a silver-lining! 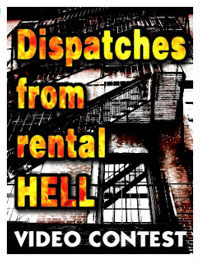 The Working Families Party is teaming up with millions of renters across New York City for the first ever video contest highlighting Rental Hell. 2. Upload it to Youtube and tag it with â€œRental Hellâ€. One Comment on Calling All Disgruntled North Brooklyn Renters!